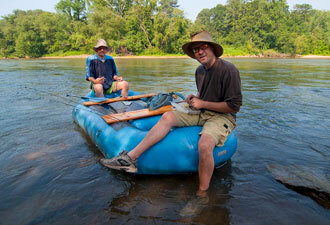 Get outdoors in the Atlanta metro area and enjoy America’s first National Water Trail! Here are some ideas for your weekend on the Hooch. Paddling: Canoeists, kayakers, and rafters can glide along on calm water or bounce and splash through rocky shoals. Watercraft are available for rent from outfitters if you don’t have your own canoe, kayak, raft or tube. Suitable for beginners, the river’s beautiful corridor is home to beavers, great blue herons, river otters, and a general abundance of wildlife. Fishing: The river’s rocky shoals and gravel bars invite wading, and more than 20 species of game fish await a baited hook. Cold water releases from Buford Dam make the Chattahoochee America’s southernmost trout stream, with a self-perpetuating population of brown trout and rainbows stocked by the Georgia Department of Natural Resources. Hiking, running, and strolling: More than 75 miles of trails can provide grand views of rock outcrops and cliff formations influenced by the Brevard Geologic Fault, or take you past historic mill ruins, or along a boardwalk through wetlands built by beavers. 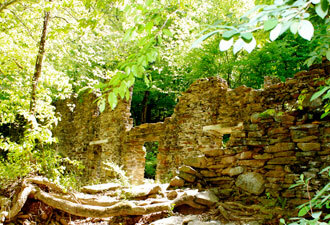 The Sope Creek hiking trails go past the ruins of the Marietta Paper Mill. Before the Civil War, this mill produced fine papers, including stock for Confederate currency and bonds. It was burned during the war, rebuilt afterwards, and finally closed in 1902. 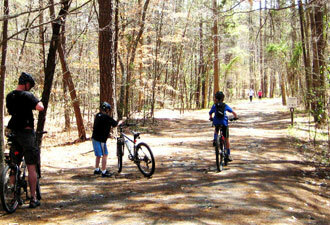 Bicycling: Sope Creek and the Cochran Shoals loop trail offer more than seven miles of trails for easy family rides and entry-level mountain biking. Most of the mountain bike trails here are suitable for beginners, with a few steep stretches verging on the intermediate. Birding: Bird watchers flock to the varied habitats in the Chattahoochee River Corridor to catch a glimpse of the park’s diverse avian inhabitants. The park hosts the annual Summer Splash on the last Saturday in July. This easy six-mile float from Morgan Falls to Powers Island is ideal for families and beginners. The city of Sandy Springs provides free shuttle buses from the parking lot to the put-in. Back to the Chattahoochee River Race and Festival is usually held the second Saturday in June. Sponsored by Chattahoochee Riverkeeper, this annual event includes competitive and recreational categories for kayaks, canoes, and stand-up paddleboards. The eight-mile course concludes at Riverside Park in Roswell, with a free family-friendly festival with music and an awards presentation. Frog Frolics take place at Sibley Pond (Sope Creek) on Friday and Saturday nights in the spring. Listen to stories, sing songs around a campfire while roasting marshmallows, and join a guided night hike to look and listen for frolicking frogs and other nocturnal wildlife sights and sounds. Paddle With a Ranger offers visitors a chance to paddle their own watercraft with a naturalist ranger on various stretches of river. Usually held on Saturdays, these programs are very popular, so please be sure to call 678-538-1200 and register in advance! Check out our park guide for maps and more information.